Maison proche des parcs Disney, piscine agréable chauffée avec supplément. Pour l'intérieur, l'hygiène des chambres sont déplorables, matelas datant des années 30 avec des tâches partouts, oreillers lamentables, les fenêtres avec des fermetures douteuses, salle de bain avec des toilettes dans un état à revoir. Les moquettes j'ose meme pas en parler. La cuisine bien équipé mais la vaisselle était pas très propre. La surprise du chef : il y a un petit coffre fort et pour l'utiliser ils osent nous demander 5 dollars par jour une honte. Enfin si vous devez retenir mon point de vu, elle n'est pas cher et c'est le seul point positif. Thanks for the review. I am sorry you felt the villa was not up to the cleanliness that my other recent guests have praised in their 5* reviews. I will certainly investigate to ensure the normal high standards are maintained. I am happy to resend in the cleaning team if the villa is not as expected when you arrive. We always look for ways to improve the facilities and décor at the villa and will look to see how we can freshen things up in light of your comments. We love the quiet and peaceful area our villa is in and the proximity to Disney so glad you did too. We always strive to provide great value for money and hope to get the opportunity to have you as our guests again. Kind regards, Mike. Thank you for allowing us to share your lovely home for 8 days. It has been a haven. Loved the villa and it’s location. Everything was clean and well stocked. We spent two weeks at the villa for our family holiday. 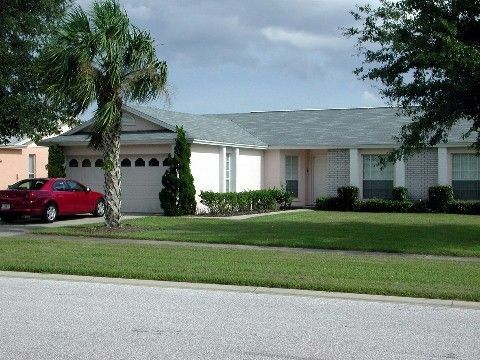 Located on a quiet, residential estate, it is within 20-25 mins of Disney World and 30-35 mins to the Universal parks. Close enough that's it not a long journey but far enough to escape the them when you've had your fill. The villa was clean and spacious and well priced. Both the owner and the management company were responsive and helpful when a problem was identified with the hot water and this was resolved as quickly as possible, which we appreciated. As has been mentioned in a previous review there are minimal supplies of everyday items on arrival. Fortunately we had decided to bite the bullet and stop at Walmart on the way there and l am very glad we did. Apart from soap, toilet paper, a single bin liner and a single dishwasher tablet the only other thing there was a half empty bottle of water. Had we not stopped at the supermarket first we wouldn't even have had enough water to last the night until the morning. However, overall we had fantastic holiday, the villa provided a great location and the kids loved the novelty of their own private pool! This villa was a pleasant surprise. Priced absolutely as low as anything you could rent in the area, it was nonetheless, spotlessly clean. The pool is generously heated and very private. The TV package is also a cut above, with a huge channel set and PVR capability. The neighbourhood and house are admittedly older, which may be why the owner offers such reasonable terms. This house stands out for those who like to golf. It is close to Clermont, where there are numerous affordable courses. If I could recommend any changes, it would be to supply the property a with a few more housekeeping amenities. Very clean and exactly what we expected. Nice house and pool was clean and warm for our cool weather we had! Prices include taxes (inc Florida Stay/Sales tax and website Service Fee), utilities (excluding pool heat) and the cleaning fee. Payment is only accepted through the website; this provides a safe and secure payment facility for both of us and ensure you benefit from the HomeAway payment guarantees.